NOTE: If you have just wandered to this page, it might seem a little strange. Its purpose is to share vacation photos with friends, but all are welcomed to view and comment. I have been blessed with travel opportunities far exceeding my upbringing. My father had deep roots and worked constantly. Only once in his 87 years did he travel beyond the adjacent states to his native Texas and that was a four-day driving trip. The month before I started college, I drove solo across the Rocky Mountains to visit an uncle in Idaho and knew I would not be content to stay in one place. Leah, my wife, had a considerably different childhood. Her parents were both educators with a greater appreciation for experiencing different places and time for traveling each summer. They did that with fervor, the five of them living in a cab-over camper. By the time we married, Leah had been to 47 states – all but Hawaii, Alaska and, inexplicably, Kansas – shortages that have since been rectified. Late in 2013, I suggested to Leah that we do something outrageous for my 60th birthday in October 2014 and she gave me free rein to come up with something. Due to previous good luck, I had visited all but three continents – Africa, Europe and South America – and I started researching those. Wise advice from a friend suggested I aim for the most outrageous first. Leah and I have owned a timeshare for about 18 years and I used it to locate a resort in Africa. However, the only place on the continent that was available and not in an area of concern was South Africa. The downside was even longer flights, the upside was they speak English. Let’s go! Easily, the cheapest flights to Durban, South Africa, routed through Dubai, United Arab Emirates, and required an overnight layover. After reading all of the official warnings, etc., Leah was hesitant to stay there. Several friends assured us it was safe and when I found a “transit hotel” located inside the airport, she agreed to go. Even though we never left the airport, the experience was enough to assuage her concerns and she’s now ready to go back and explore the country. We flew from Dallas to Dubai (15 hours) and then to Durban (8 hours) on Emirates Air, which we loved. Service was great, the seats roomy and the entertainment system outstanding. As our flight to Africa took off, we were able to spot the distant Burj Khalifa, the world’s tallest building. 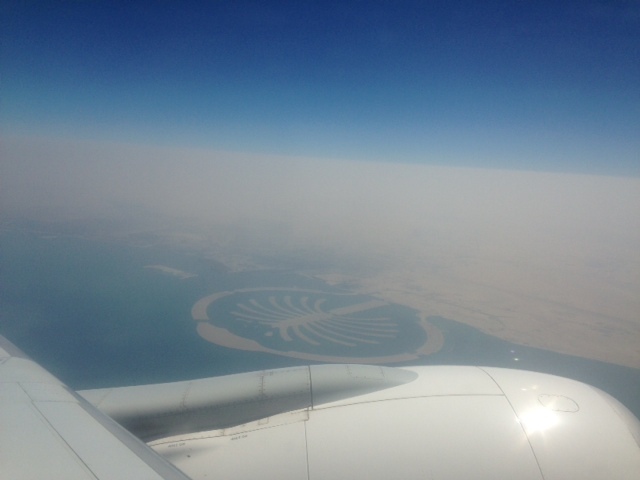 The photo above is of one of the Palm Islands, built as a land reclamation project. Durban is the second-largest city in South Africa and home to the continent’s busiest port, but it wasn’t really where we stayed. Our resort was actually just north of there in the town of uMhlanga (pronounced oom-shlanga) in an area known as uMhlanga Rocks. This is a resort town that caters primarily to South Africans from other areas, like people from St. Louis going to the Gulf Coast. In fact, we were not aware of any other international visitors at our hotel other than us. The dominant feature is the beach. 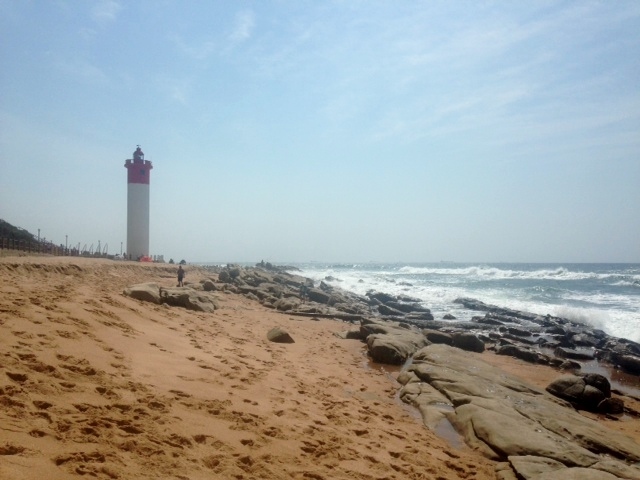 The photo above is looking north at the lighthouse and in the direction of our hotel. We were around the halfway point of a three-mile promenade, a paved walkway that ran above the beach. Walking that stretch became one of our great pastimes. We bought lunch supplies at a local grocery store but ate out every breakfast and dinner. Prices were amazingly low. Meals for six days, drinks and even a couple of souvenirs totaled less than $160. We did not get out much. Everyone asks if we went on a safari, but the distance and cost kept us from seriously considering it. What we really like to do is try to “get into” one area. The neatest thing we did was talk to people. I even picked up a new Facebook friend, a gentleman who sang on the patio during dinner one evening. We took a couple of trips organized by the resort – uMhlanga Sands – including a trip to largest mall in Africa, Gateway Theatre of Shopping. That trip’s noteworthy only to say that malls are malls, but we did enjoy looking around. As always, we were mainly looking at people. Another trip was to visit the Moses Mabhida Stadium, one of the host stadiums for the 2010 FIFA World Cup and home to the world’s largest swing. Unfortunately, cool rainy weather resulted in the resort canceling the trip. We did get to visit the KwaZulu-Natal Sharks Board, an organization that maintains shark nets and drum lines off the coast to protect bathers and surfers from shark attacks. 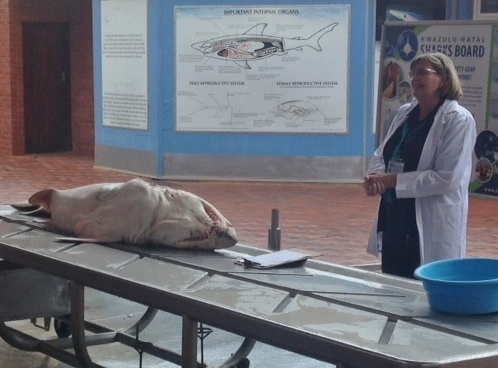 They have a museum that features a shark dissection, shown in the photo above. The room was ours for seven days, but we departed a day early to catch the next leg of our dream trip, a transatlantic cruise. We were back aboard Emirates Air for an overnight flight to Dubai but this time with just a three-hour layover before catching a five-hour flight to Barcelona, Spain. Time change was not an issue on this trip, but a near-sleepless night kept us close to our hotel the rest of the day. The hotel, Hesperia Tower, had a definite futuristic flavor to it and quite a view. We did take a stroll through a neighboring nature park, on the edge of which sat this 15th century church seen with Leah in this photo. Imagine it was here when Christopher Columbus reported to Queen Isabella I and King Ferdinand V after his first trip to the Americas. Apparently, it’s still in use. After a light meal in the hotel with a beer and tapas, we got a good night’s sleep and headed out the next morning for the docks. We shared a cab with a great couple from Arizona who were taking a Mediterranean cruise on a different ship. In fact, there were four or five cruise ships docked there that Sunday morning and we ended up getting in a pretty good walk just to get to ours. We sailed on the Noordam with Holland America Lines. While large, it’s not among the larger ships, but it was glamorous. We felt our small town side maybe came out a time or two. If you have any questions about the cruise, put it in a comment or contact me directly. There’s a lot that could be said, but I feel like most of it would bore the majority of readers. Early Monday found us docked in Valencia, Spain. We booked an excursion here that entailed a bus ride inland to Coves de Sant Josep in the town of La Vall d’Uixo. The Caves of San Jose were carved by an underground river. After entering the cave and walking down to the river, we boarded a series of small boats for a tour. At one point, we were put out and walked a ways and then rejoined the boat at another spot. No photos as they are not allowed. 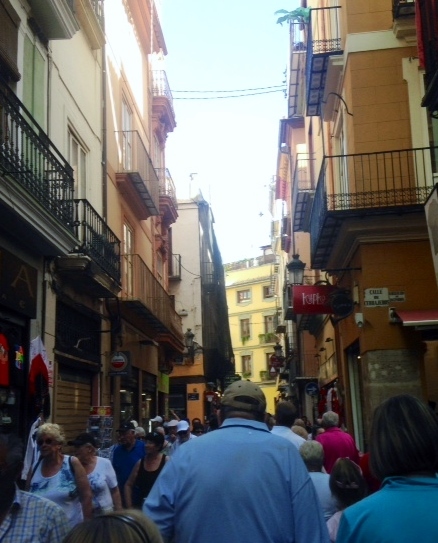 En route back to the ship, we routed through downtown Valencia. Our tour guide did a great job of pointing out various things of interest all along the way, from the old buildings in the city to the vast orange groves in the country. He was immensely proud of his homeland and it occurred to me that any good tour guide should be. The photo above looks down one of the narrow streets. This one, now, is used by pedestrians only, but there was plenty of traffic around. After walking for a while, we all huddled up on a corner. After talking a little more about the specific area, he dismissed us for maybe 30 minutes to roam freely. Leah and I ventured into a sidewalk shop to buy a drink and found a bench in a small park-like area. It was obvious that the bulk of the people pausing and passing through there were locals, which is to say it’s not an area cultivated just to cater to tourists. Tuesday found us in Cartagena, Spain. The ship was docked a ways from town and they provided shuttle service between the two. We hopped off and started looking for landmarks to figure out which way to go and were soon talking with another couple from the ship. 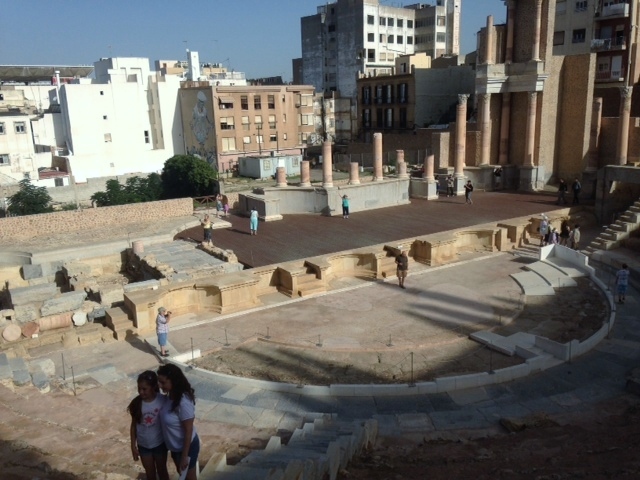 The four of us hit the early morning streets together and soon located Teatro Romano de Cartagena. A 1988 excavation in downtown Cartagena that was preparing for the construction of shopping areas unearthed remains of an ancient Roman theater. Numerous artifacts are displayed in a museum setting as one walks toward the theater. Suddenly, it opens up before you. Built 1-5 centuries before the birth of Christ, the theater was able to seat some 6,000 people. Leah, the former theater teacher, hit the stage to strike a pose. She’s the little blue/green dot over the black dot in the middle of the stage. How do you say “ham” in Latin? Along with the other couple, we walked through a good bit of the area before working our way back to the ship. Our final Spanish port was Malaga, one of the oldest cities on the planet. 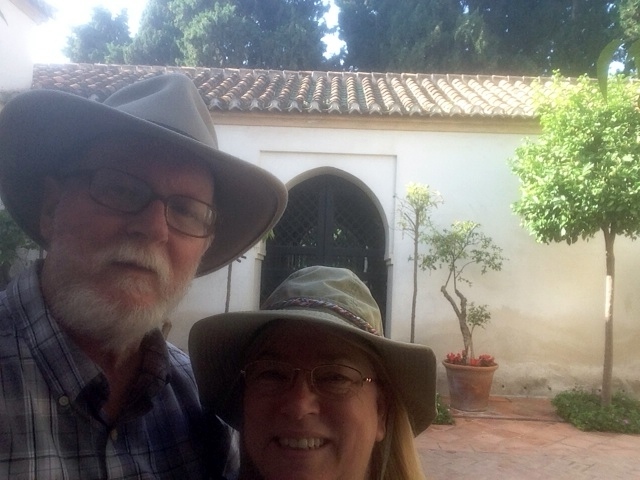 Leah and I hiked quite a distance around town, finally finding our way to the Alcazaba, an ancient palatial fortification that included living quarters down the hillside and battlements on the top. This was a self-guided tour with little in the way of signage, almost all of which was in Spanish only, but a little imagination went a long way. I’m not sure if it’s temporary or permanent, but we could not walk from the bottom section to the top without leaving and taking a walkway and stairs outside the walls. It was a considerable climb. 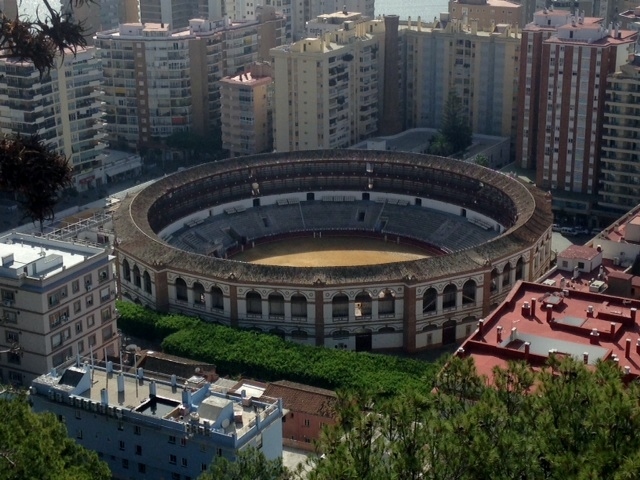 During one break, looking out over the city of Malaga, I shot the photo of the bullring. Why? I just thought a bullring in Spain was interesting. Gibraltar was an incredibly interesting port call on Thursday. It is a self-governing British Overseas Territory that is home to about 30,000 people. It still has strong ties to England, which still provides Gibraltar with defense and international relations. That’s important because Spain deeply wants to take over the 2.3-square-mile area that occupies the southern tip of the Iberian Peninsula and overlooks the waterway connecting the Atlantic Ocean to the Mediterranean Sea. The photo above was taken from atop the Rock of Gibraltar. 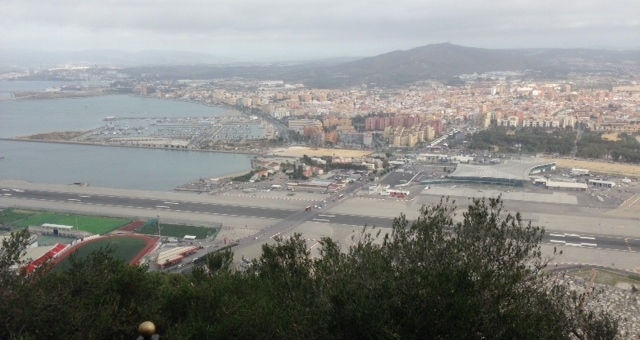 The pavement running from left to right is part of the single airstrip in Gibraltar. The pavement crossing perpendicular to it is a highway. When aircraft is about to use the strip, barriers go down and cars stop and wait. Just beyond that point, though not really discernable in this photo, is the border with Spain. The tour of the Rock took us into one of the tunnels dug for the purpose of placing artillery capable of firing out at approaching ships. It was rather amazing and a particular source of pride for our guide. 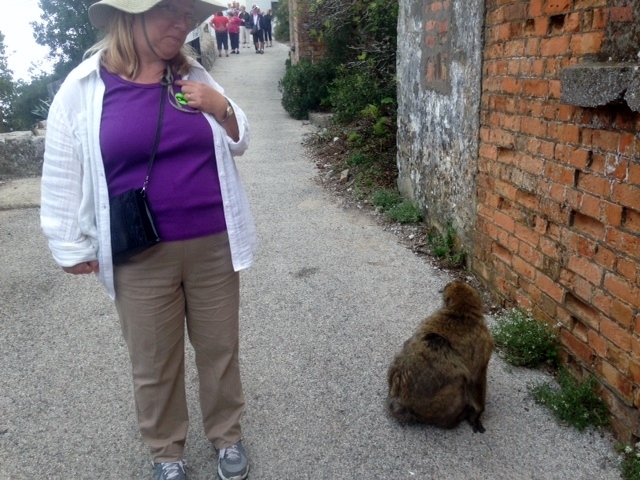 And, of course, no visit to the Rock of Gibraltar is complete without seeing the Barbary macaques, commonly called apes but technically monkeys. Legend has it that if the macaques ever leave Gibraltar, so will the British, perhaps because neither is indigenous to the peninsula. It’s not known how the monkeys first got there (which was before the Brits did), but they are the only wild monkeys on the European continent. There are five troops of monkeys on the Rock and since there is not much for them to eat in the wild, they are given food every day. Coincidentally, that also makes them easier for tourists to observe. In this photo, Leah eyes a monkey that had just skittered across her feet. As we left Gibraltar, with the lights of the African coast off our port side, we headed into the Atlantic Ocean, sailing Friday and Saturday before docking Sunday morning in Ponta Delgada, the administrative capital of the Autonomous Region of the Azores in Portugal. It is located on São Miguel Island, the largest and most populous in the archipelago. Here we had booked our third and final excursion. Our guide took us to the Sete Cidades caldera. We stopped in a little town, which I think was also called Sete Cidades, primarily for a potty break and for some to get coffee or soft drinks. Leah and I walked around the town a bit and that’s where I snapped the photo above. 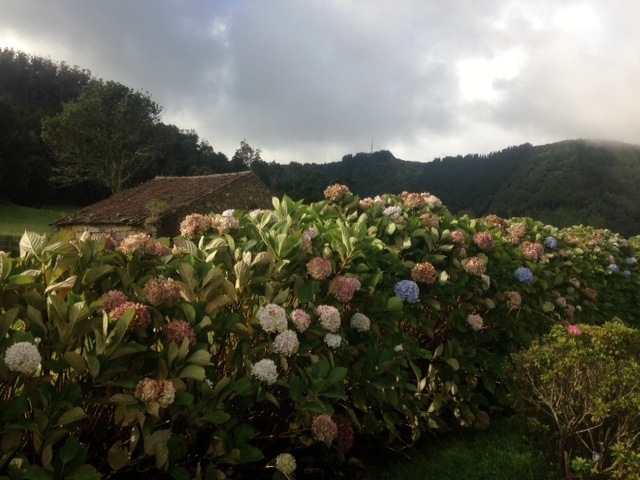 On the drive up, I saw everywhere that roads were lined with what were essentially fences of hydrangeas. They were everywhere. 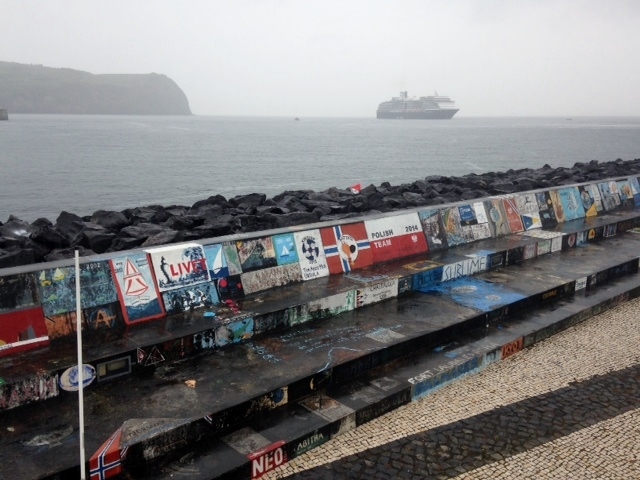 Monday, we made our last port stop before crossing the Atlantic, this at the small city of Horta on the island of Faial. The docks there could not handle a ship the size of the Noordam, so we anchored in the bay and took tender boats ashore. Working as tender boats is a secondary duty to what we first think of as lifeboats. 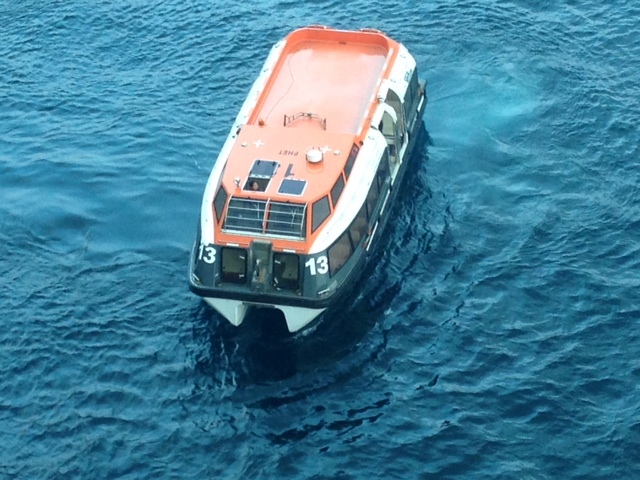 The photo at right is the lifeboat we were designated to take in case we were ordered to abandon ship. Yes, it is No. 13. Once ashore, Leah and I headed off walking in a fairly good rain, our objective being a trail up the side and partway around the rim of the caldera of an old volcano. It’s all but an island, connected by an isthmus to the main island. Before we got away from the docks, we came across an area where yachters have taken to painting a testimony to their visits. Pictured above, this is quality graffiti. In the background rests our ship. As we cut across the isthmus, with the rain slacking a bit, I saw a magical image across the water and walked to the bluff to get a good look at it. 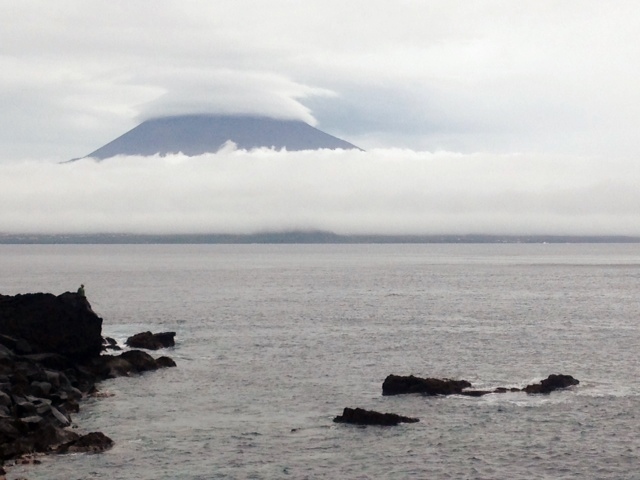 The photo at left shows Mount Pico, a volcano on the neighboring island of Pico. At 7,713 feet elevation, it’s the highest mountain in Portugal. It last erupted almost 300 years ago. 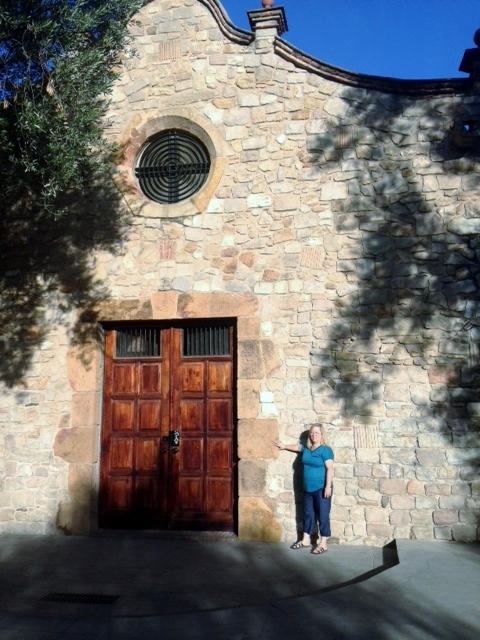 We continued to the trail, which initially consisted of climbing to a small chapel. The trip was mostly over steps of various makes. Once at the chapel, which was locked, we find the trail continuing at the back through fairly thick shrub-like growth. More than once, we wondered if this was really a trail. Upon reaching the point, there seemed to be nowhere to go but back, but Leah finally spotted one of the trail markers and we found the path going down at an incredibly steep slope. Remember, it had been raining and the path was pure mud with occasional rocks and roots. I went first, hanging onto bamboo and some kind of thick shrub that held remarkably well. I’d get my feet set and then Leah would follow. At places, the only option was to slide. In a phrase … we had a ball. Once we were on level ground, I took the panoramic photo that’s at the top of this article. We headed back to the ship, about an hour’s walk, and ran into one of our dining table couples. “What happened to you?” she asked. I’m not sure she agreed with our idea of fun. 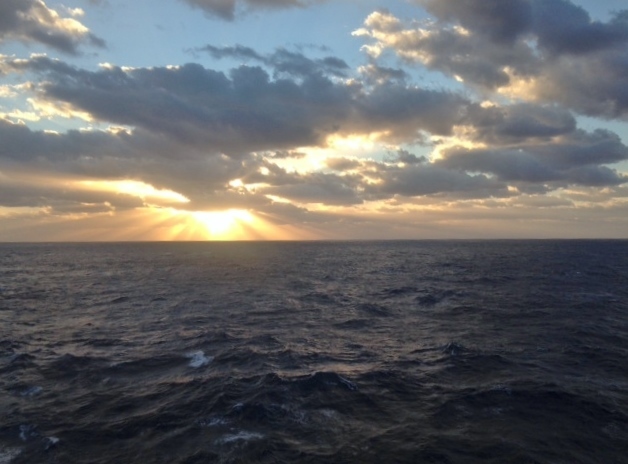 Next was the part of the cruise that was most intimidating … six days at sea. We read, walked, talked, played games, ate, walked and visited with people. One of the neat things Holland America does (don’t really know about others) is carry a Protestant and Catholic chaplain on the trip. Our minister led Bible studies each morning we were at sea and had services all three Sundays. On a whim, we decided to learn about the onboard art program. A company known as Park West Galleries does this on more than 100 cruise ships. On probably every sea day, they had a class in art appreciation and/or an art auction. We were there every time they had a program, got to know the people a bit, learned quite a lot and even won a print that’s to be shipped to us. Yes, we were surprised to have so much fun. There were a couple of periods where the seas got a bit rough but never too bad. We spent quite a bit of time just looking out over the ocean, such as the sunrise photo above that I took off the stern on our last morning at sea. We were among the first group to leave the ship upon docking Monday morning in Fort Lauderdale. One reason we could do this so easily was we had no baggage to speak of. We decided beforehand, with five flights involved, we wanted to go without checking baggage if possible. To live four weeks out of a carry-on bag each required careful planning. We bought clothing that could be washed out in a sink and hung to dry. We simply did without some things. I left my camera at home and shot everything with my phone. We kept souvenir shopping to an absolute minimum. In Fort Lauderdale, we picked up a rental car and drove home over the next three days. The photo of the door at a rest stop in Florida was one I couldn’t resist. Look at it; do you see what I saw? The sign prominently reads, “Hands Free Automatic Operation.” What’s that right next to it? Yep, a manually operated door handle. This is an abbreviated look at our dream trip. If you have a question, put it in the contact form below and I’ll try to answer it. Good for both of you! Getting those passports used and stamped. Sure happy for your travels. Thanks, Duane. Getting passports stamped is fun.